Be the first to share your favorite memory, photo or story of Elke. This memorial page is dedicated for family, friends and future generations to celebrate the life of their loved one. Mrs. Elke Koppenwallner Ratliff, age 75, of Cedar Bluff, VA passed away Thursday, December 06, 2018 at Tazewell Community Hospital. She was born March 22, 1943 in Salzburg, Austria. She came to the US with her grandmother at the age of 13. Elke graduated from Montgomery Blair High School in Silver Spring, Maryland. She loved her grandchildren, animals, gardening, and music. She enjoyed reading and taking care of her cats. She was preceded in death by her parents, Paul and Inge Moeller Koppenwallner; her stepfather, Ernest Amos. 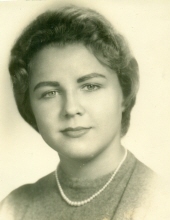 Those left to cherish her memory is her loving husband of 55 years, John B. Ratliff; three children, Christina Griczin of Woodford, VA, Julie Ann Ballard of Richlands, VA, and Stephen Eric Ratliff and wife Dara of Richlands, VA; two sisters, Heide Smock of St. Paul, MN and Marion Suski of DE; two brothers, Thomas Amos of DE and Joe Amos of MD; nine grandchildren, Kelli McBee, Dylan Griczin, Krista Tiller, Kimberly Rasnick, John Rasnick, Erin Lamie, Logan Steele, Morgan Cunningham, and Ryan Perkins; two great-grandchildren, Madelyn Tiller and Connor McBee; two cats, Mocha and Maggie; several nieces and nephews also survive. The family will receive friends from 5 – 8 p.m. Friday, December 7, 2018 at Singleton Funeral Service in Cedar Bluff, VA.
Funeral Services will be conducted at 1 p.m. Saturday, December 8 at the Singleton Funeral Service Chapel with Pastor Steve Teggler officiating. Burial will follow in Greenhills Memory Gardens at Claypool Hill, VA. Pallbearers will be family and friends. Online condolences may be sent to the family by going to www.SingletonFuneralService.com. Singleton Funeral Service is serving the Ratliff Family. To send flowers or a remembrance gift to the family of Elke Ratliff, please visit our Tribute Store. "Email Address" would like to share the life celebration of Elke Ratliff. Click on the "link" to go to share a favorite memory or leave a condolence message for the family.